Milchhof Sterzing, in Italy’s South Tyrol, once again favors the equipment of OYSTAR A+F. 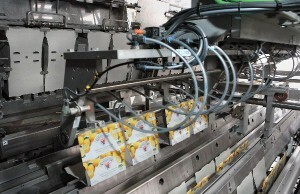 It has just installed two new packaging lines with integrated top-sleeving technology for yoghurt cups. Kirchlengern, July 8, 2013. The new SetLine packaging systems can handle up to 22,000 cups per hour. Products are supplied by conveyor belts and sleeved to sets of 2 or 8 cups. The SetLines also support operation without sleeves, allowing Milchhof Sterzing to package single cups as well. Switching between formats is a snap. The newly delivered SetLine packaging systems feature powerful with special focus on the product transport, operability and ergonomics. Furthermore, the systems now take a lot less effort to switch between formats. Another highlight is the servo-controlled tray compensator for pre-grouping and positioning of trays. OYSTAR A+F has deepened its successful business partnership with longstanding OYSTAR customer Milchhof Sterzing with this sale of new SetLine packaging systems. Milchhof, run as a cooperative, purchased its first system in this series back in 2007 and has been operating it the SetLine, as well as a high-performance OYSTAR Gasti cup filling & sealing system ever since. South Tyrol-based Milchhof markets its dairy products throughout Italy, where the company’s annual sales in the yoghurt market of approx. 62 million euros makes it one of the leading producers in the nation. OYSTAR. The Packaging Group is one of the world’s leading suppliers of packaging machinery, technology and services. OYSTAR has extensive know-how in the key industries of dairy products and food, as well as pharmaceuticals and cosmetics. Based in Stutensee near Karlsruhe, Germany, the holding company currently represents 10 manufacturing companies in Europe and Asia as well as numerous sales and service companies. At present OYSTAR Holding employs a workforce of approximately 1,400 worldwide and generated a total of approximately EUR 250 million in sales in 2012.